Irish fairies fall into two main groups: sociable and solitary. Perhaps the best known of the solitary fairies are the leprechauns. Leprechauns have the distinction of being the most solitary of the solitaries, avoiding contact with humans, other fairies, and even other leprechauns. Although the leprechaun has been described as Ireland's national fairy, this name was originally only used in the north Leinster area. Variants include lurachmain, lurican, lurgadhan. The ancient origins of what we know today as the leprechaun was a Euro-Cletic god named Lugh (pronouced "Luck"). Lugh was as important a god to the ancient Euro-Celtic religion as Jesus is to our own Christianity. Lugh was the great Sun God of the Irish and Eauro-Celts, patron of Arts and Crafts, leader of the Tuatha d� Danaan. Many Europena cities were named for Lugh such as London, L�on, Loudan, Lyons and others. These two-foot tall, unfriendly, gruff men (there are no female leprechauns) prefer to pass their time making shoes for other fairies. They usually wear a green coat, a green hat, and a shoemaker's apron. The name leprechaun may have derived from the Irish leath brogan (shoemaker), although its origins may lie in luacharma'n , Irish for small or little body or from Luch-chromain, meaning ?little stooping Lugh? Due to their thrifty nature, they are trusted to guard fairy treasures and hide their pots of gold very carefully. But rainbows and the sound of a shoemaker's hammer provide humans with visual and audio cues as to the whereabouts of a leprechaun and his hidden treasure. According to legend, If caught by a mortal, he will promise great wealth if allowed to go free. He carries two leather pouches. In one there is a silver shilling, a magical coin that returns to the purse each time it is paid out. In the other he carries a gold coin which he uses to try and bribe his way out of difficult situations. This coin usually turns to leaves or ashes once the leprechaun has parted with it. However, you must never take your eye off him, for he can vanish in an instant. The leprechaun 'family' appears split into two distinct groups - leprechaun and cluricaun. Cluricauns may steal or borrow almost anything, creating mayhem in houses during the hours of darkness, raiding wine cellars and larders. They will also harness sheep, goats, dogs and even domestic fowl and ride them throughout the country at night. Most pet owners would NEVER knowingly poison their animal, but many do! They feed their pets nutritional supplements that contain artificial chemicals in amounts toxic to many types of animals and even children. 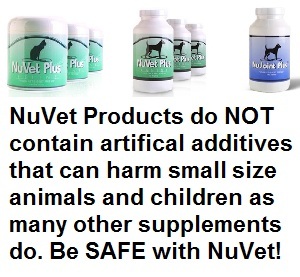 We recommend NU-VET products. These natural supplements help meet the nutritional needs of your pet, without exposing them to the risk of artificial chemicals. 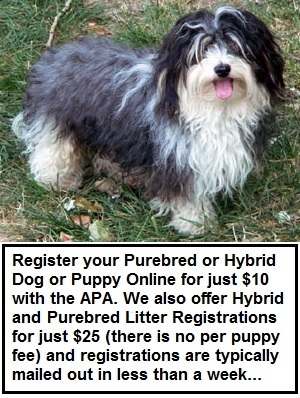 Call 1-800-474-7044, Discount Code 42050, to order by phone. Order NuVet online. Click on the e-store link. Save BIG on supplements, toys, flea collars &more!